To say life didn’t start promisingly for him is a vast understatement. He was born on November 12, 1971, in the impoverished village Dong Shi Gu (东师古) in Yinan County, Shandong province, the youngest of five boys. He lost his vision to high fever when he was around one year old. He didn’t go to school until 18 years old. In the Chinese countryside, where living is at its barest, expectations are a rare commodity to begin with, and for the disabled, there are none. For most of the part, they are seen and treated as a family scourge that must be borne. Being blind, sometimes he got picked on. He couldn’t catch the offender, but he could remember his voice. Next time he heard it again, he would grab him and teach him a lesson. He grew up to be a young man who liked to talk and liked to laugh, who was tall, strong and, by all standards, handsome. At 18 years old in 1989, he entered Linyi Elementary School for the Blind. From 1994 to 1998, he attended the School for the Blind in Qingdao (青岛), Shandong. From 1998 to 2001, he studied in Nanjing University of Chinese Medicine. At the time China had only two universities that accepted blind students, and, nationwide, only 40-50 blind people were admitted each year, all studying Chinese medicine and massage, the only subject deemed suitable for them. Still, he was one the luckiest to have gone that far in life. His first fight was a fight for himself. China has a law called the Law of the People’s Republic of China on the Protection of Disabled Persons, first promulgated in 1990, stipulating that “People’s governments at county and township levels shall, in line with the actual conditions, reduce or exempt disabled persons in rural areas from obligatory labor, public utilities fees and other social obligations.” When his father read the law to him, he was very excited that he would be less a burden to the family. But a few years passed, and he was paying more taxes and fees, not less. In 1996, his annual payment for total 8 different taxes and fees was as high as 368 yuan when his annual income from the land was about 500 yuan. He refused to pay, and the local government recorded his “debt” in its books. When he challenged the tax collectors, he was told that “I know there is the law, but we don’t enforce it, and what can you do about us?” Still a student in Qingdao, he carried the law with him and went to the township government, then the municipal government, and then all the way to Jinan (济南), the provincial government. Getting no results, he travelled to Beijing as soon as the winter break started in 1996. He followed the petition procedures and got a “directive”(批示) in 1997. Finally the township government exempted all the payments and gave him an annual 200 yuan subsidy. But in the same year, they took away more than one third of the land allocated to him, the equivalent of 240-yuan income. In 1998, he read an article about the illegality of splitting agrarian land into two types (两田制) that was widely practiced in his area, that is, 40% of the village’s land was allocated based on family size, and 60% was for rent; whoever wanted to farm on it had to pay a fee. He went to Beijing again in the summer and succeeded in ending the illegal practice. After the two petitions, “people at the township government hated me to death,” he told a journalist in an interview. Even though he had success in his two times of petitioning, he was deeply disappointed by the way the lower governments handled the issues. “Petitioning is pretty useless,” he said. “To defend our rights, we must rely on the law.” In other words, he put his faith in the rule of law. 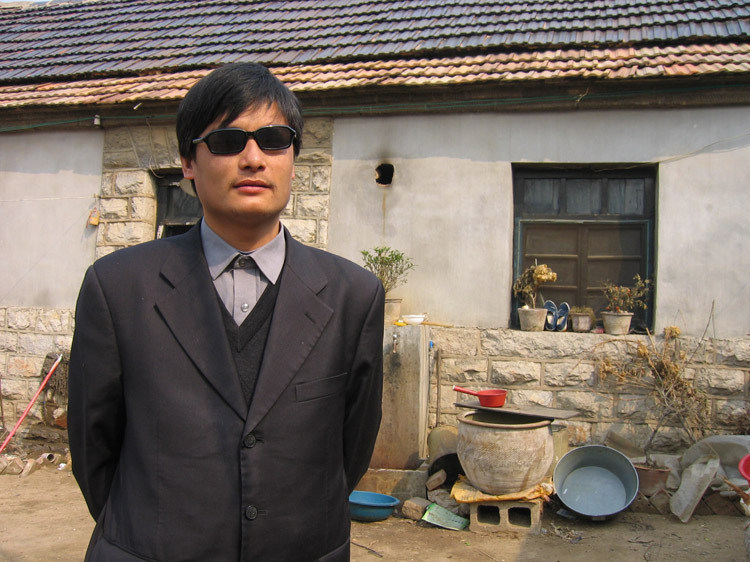 In his first case, Chen Guangcheng helped another blind man in another township to sue a village head who forced the disabled man to dig dirt and to pay taxes. When the blind man refused, the village head chided him through loud speakers and harassed him face to face. 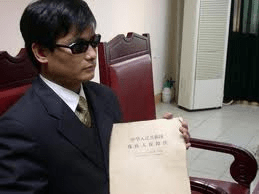 Chen Guangcheng filed a complaint on behalf of the blind man and won the case. More people came to him for help. He helped other handicapped people, women who were subjected to late-term abortion, people with mental illness, farmers and small business owners who were overtaxed or taxed illegally, almost always against governmental personnel or entities, from village heads to township governments, local tax authority, public security bureau, and even the Beijing subway authority. 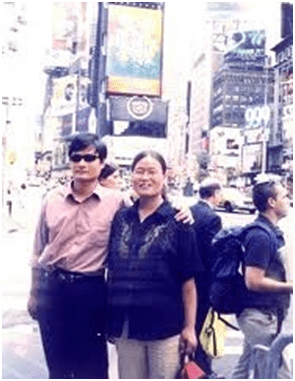 A local journalist friend of his estimated that, from 1996 to the time he lost freedom in 2005, Chen Guangcheng helped about 3,000 people directly or indirectly through legal representation and consultation. All for free. As you can imagine, it is not easy to be a lawyer, barefoot or otherwise, and blind. In China, only two laws, the aforementioned Protection Law and the Marriage Law, had braille versions. He had to rely on his father, and later his wife, to read the laws to him. He once applied to audit law courses in Jiaotong University and was rejected unless he was an officially anointed “national model worker ” or a world sports champion. He was neither. For everything he did, he had to give ten times more efforts than a normal person. At the same time, he is incredibly able, Chinese medicine and law notwithstanding, he knows how to use computer, and can surf online. He uses cell phone, fax, copier, and recording pen. And he speaks some English. When he first started, he said in an interview, people at the court often sympathized with the disabled and the poor who also had the law on their side. But when pressured by people with power, they put aside both their conscience and the law, creating hurdles to thwart him and his clients. His clients were often beaten by hired thugs for resorting to the law, while he himself received telephone threats. One night, when he was walking alone on the road, a motorcycle sped toward him from behind but braked abruptly in a screech. After moments of terrifying silence, it drove away. “Perhaps he was a hired murderer who changed his mind the last moment,” Chen Guangcheng speculated. Who says he doesn’t have vision? Meanwhile, he established a library to spread helpful information to the villagers, and he invited lawyers and officials from Beijing to his village to give lectures to the handicapped about rights and self-reliance. His activities attracted attention from media far and wide. In March 2002, he appeared on the cover of Newsweek. In 2003, he was selected by the US State Department’s International Visitor Program to visit several American cities and organizations of handicapped people. In the same year he was named one of Linyi’s Ten news personalities by the municipal government. Several domestic newspapers and magazines profiled him. He was, in short, a great citizen any reasonable society can have, loved by people and recognized by the authority. That is, until he fell afoul of it. 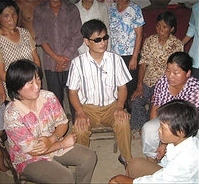 Chen Guangcheng with Guo Yushan (far right), Teng Biao (second right) and villagers. 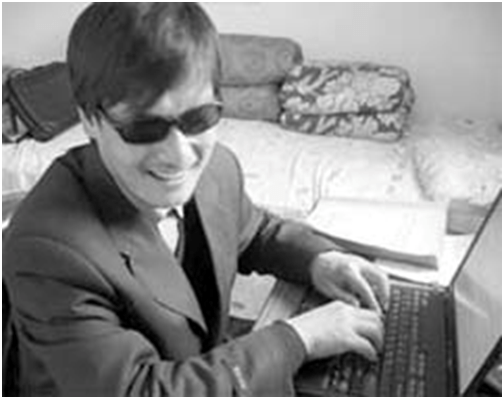 Chen Guangcheng was released on September 9, 2010, and has been under illegal house arrest since then. His home is monitored by multiple cameras, floodlit 24 hours a day, and all communications with the outside world are severed. Close to a hundred men guard his home and are present on every road leading to his village, intercepting, beating, robbing, and humiliating visitors. After a video of him was smuggled out and shown to the world, he and his family were beaten. 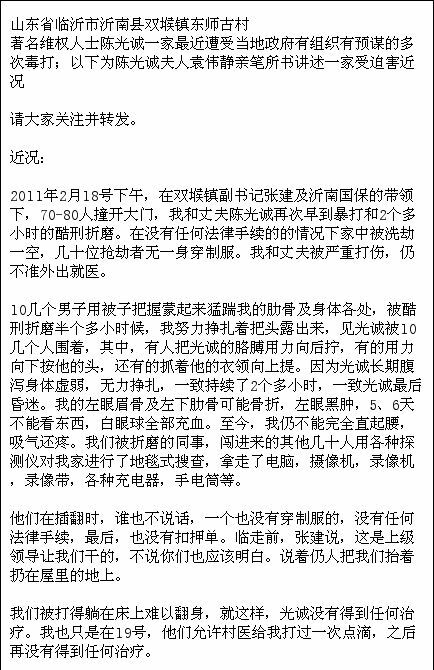 In a letter smuggled out later to seek help, his wife described how Zhang Jian (张建), the Deputy Party Secretary of Shuanghou Township, and about 70-80 national security officers raided their home and beat the couple severely, how they searched the premise and took away their computer, video recorder, tapes, chargers, flashlight and more. Later on, their windows were covered with metal sheets, and more objects were seized including Chen Guangcheng’s cane, paper and pens. Their daughter was not allowed to leave the house, and her books and toys were removed too. Three people followed Chen’s mother wherever she went. Mostly worryingly, Chen Guangcheng’s health was deteriorating from gastrointestinal bleeding. In late July, Chen Guangcheng succeeded in calling a friend in Beijing on a stormy day when the mobile phone block failed. He and his wife were again severely beaten. The efforts to free Chen Guangcheng started as soon as he was released from prison when a trickle of friends and netizens tried to visit him without success. Recently, the trickle has become a stream, widely reported and closely watched by many. Who Are They? Where Does the Order Come from? Who are Chen Guangcheng’s persecutors anyway? We know there was Li Qun (李群), the Party Secretary of Linyi who has since been promoted to Party Secretary of Qingdao, a much bigger and more important city, and a member of the Standing Committee of Shandong Provincial Party Committee. There was Liu Jie (刘杰), the head of Linyi Public Security Bureau and scores of other officials and officers from the government to the court to the township. Why are so many people in China willing to defy the law to carry out orders from their superiors? Where else on earth is power so unchecked, so ugly, that hundreds of thousands of people are subjected, in such a blithe way, to unbearable suffering for the interest of a mere few? For the audience of this blog, it is particularly interesting to note that Li Qun was an assistant to the mayor of New Haven, Connecticut for three months after studying in the MPA program in the University of New Haven, in the early 2000s, through Shandong province’s cadre overseas training program. He was so proud of that three months that he wrote and published a book entitled “I Was an Assistant to an American Mayor” (《我在美国当市长助理》, Xinhua Press, 2004). Since Chen Guangcheng’s case has become an international affair, it is clear that what has happened and is still happening in Linyi has the backing of Beijing. Where does the order come from? Why are they so afraid of this blind man? Chen Guangcheng hails from a very special place. As Li Chengpeng (李承鹏), a renowned online commentator reminded us, a mere 170 kilometers northwest of Linyi is the home of Confucius who tirelessly preached “benevolent governance.” Even closer to him once lived Jiang Tai Gong (姜太公) and Mengzi (孟子) who advised the rulers to always put people and their communities first so as to nourish peace for everyone. With affection, his friend Teng Biao (滕彪) described Chen’s warm, confident voice, his sensibility to others’ pain, and how he directed their car, followed by officers, “insouciantly” through the streets to eventually get rid of their pursuers. The sages would have been proud of Chen Guangcheng. Indeed, he, like them, represents the best of China. A very short distance from Chen Guangcheng’s village was a place called Meng Liang Gu (孟良崮), where in 1947, the Communist Army fought and defeated the Nationalist Army and moved another step closer to the new China they envisioned. Linyi area was one of the oldest bases of the Communist Party before 1949 where people supported and made sacrifices for the communist cause. Sources for this article: Writings by Teng Biao (滕彪), Jiang Tianyong (江天勇), Guo Yushan (郭玉闪), Zhai Minglei (翟明磊) and others. I apologize for not documenting the sources professionally as I should. By China Change in Human Rights & Civil Rights, Interviews, Rule of Law on November 12, 2011 . Excellent & informative. Sadly, I have no confidence that it will end well for him. Whatever happens, unless they are willing to uphold the Rule of Law that they pay lipservice to, it will end badly for those in power, because this will not be glossed over by historians. Thank you very much for this. Is there by any chance a Chinese version that I could send to my mother? Or maybe some links to Chinese sources? Thanks in advance!